2. Line a 9 inch square baking dish with parchment paper. 3. Lightly coat the parchment paper with cooking spray. 4. Add the melted butter to a large mixing bowl along with the sugar, flour, cocoa powder and eggs. 5. Stir until everything is well combined. 6. Gently fold in the dark chocolate chips. 7. Pour the brownie batter into the baking dish and spread in an even layer. 8. Sprinkle the top of the batter with a pinch of salt (do not use too much). 9. Bake for 20-25 minutes. You want them to be cooked through yet fudgy. 10. Allow to cool and cut into 12 squares. 11. Lightly dust with confectioners’ sugar and serve. Make ahead desserts make life so much easier. These whole grain dark chocolate brownies are kid friendly and adults will love them too. 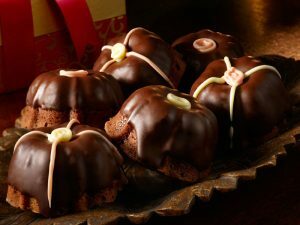 Bake them in a bundt pan and dip in dark chocolate to make them extra special. That pinch of salt accompanied by the dusting of powdered sugar is the ideal finish and draws out all the lovely qualities of the dark chocolate. During those busy weeks, bake a batch of these make ahead desserts and refrigerate. Once dessert time rolls around, warm them up and serve. They will taste like you just took them out of the oven. You can serve them alone, with a scoop of ice cream or whipped cream and a few fresh berries. There is also the option of individually wrapping the brownies for convenient lunchbox treats.